I just don't quite get the whole ufo thing, I must admit. If you google "ufo" you get well over 3 million hits. Of course, I'm just adding to that already massive google weight. I'm okay with that, though. There are about 321,000 image hits alone. I waded through several pages of pictures. They ranged from pictures of clouds and helicopters and snowboarders and airplane lights, to fuzzy or grainy photos than made me think, "hmm!" 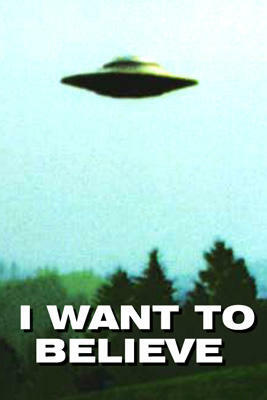 All the conspiracy theory stuff about ufos and the government seems less mysterious, though. The idea of possibly-threatening but perhaps benign beings, with mysterious and incomprehensible powers--and the government aids and abets--seems a very valid fear, on some level. It's so much easier to spin an elaborate UFO metaphor to provide a mythology to explain our own feelings of powerlessness. It puts a false face on that which we fear and despise, so we don't actually have to confront the reality, directly. Karl Rove might really, truly, be a hostile alien though. There was some movie with Jodie Foster where she said something about looking out there and thinking it was arrogant to believe we are the only ones. That is badly paraphrased I am sure, but what I can't figure out is why, if they have space travel, they would want to come here.